San Juan in Valencia is an odd one out - it is not a traditional costumed fiesta. Nor is the religious name appropriate - in reality San Juan is a very paegan celebration of Summer Equinox in Valencia. There are no parades or rituals - just get drunk, socialise and have fun. - have fun all night with the crowds on the beach! 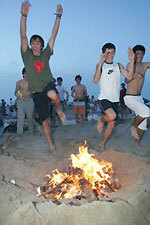 On the night of San Juan the huge Valencia beach will be filled with people and bonfires. It is pretty much just a huge crowd drinking together. The Valencia beach will resemble a Viking night camp, wildly celebrating victory. After all, it's only once a year that the police looks the other way while you burn fires and get wildly drunk on the beach! Not really a place for families, but if you are a younger traveller (or an older and adventurous), you will have a fantastic time in the mayhem of San Juan. The party will go on all nigth long. If you wish, you can participate in the old San Juan tradition - jumping over a bonfire while making a wish. There is no secific location. The entire beach will be packed. You won't be able to miss it. Bring your drinks.